Change your eye color with Freshlook color contacts available with or without a prescription to either correct vision or to wear as a fashion statement. The Freshlook brand from Ciba Vision is one focussed purely on colored contact lenses. You can try up to 12 different lens colors in the Colorblends range, contacts that CHANGE your natural eye color, as well as 3 color ENHANCING shades, suitable for pale-colored eyes only. 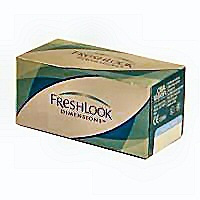 Freshlook lenses are very popular as they are also available in TORIC form for people with astigmatism. Plus, the range also includes the ONLY daily disposable colored contact lens on the market. Freshlook Colorblends come in 12 different shades as a soft lens designed to be worn for up to 2 weeks. They are available in prescriptions from +6.00 to -8.00 and have a diameter of 14.5 and a base curve of 8.6. Freshlook Dimensions come in the same sizes and have the same wear time but only have 3 color options for light-colored eyes. I can't wear either of these Freshlook contacts as the 14.5 diameter is too big for the shape of my eye - they are the same width as Focus Dailies, also made by Ciba Vision. I tried Dailies once and had to throw them away after just a few hours as they were so uncomfortable. If you don't need contact lenses to correct your vision, you can still try the above lenses as they are also available in PLANO ie. zero prescription form. BUT, for the reasons mentioned in the white box above, be sure to visit an eye doctor to check that they will actually FIT your eye shape before getting carried away and placing an order! Many celebrities are changing their eye color almost every day using Freshlook color contacts, which explains why they are so popular. Dimensions and Colorblends come in boxes of 6 lenses so you get 3 pairs for your money, working out at just over $16 per pair. If you can't decide on the color for you OR you've had your eyes tested and found that the 14.5 diameter is too wide, then an alternative option is to try ONE-DAY Freshlook contacts which have a diameter of only 13.8. 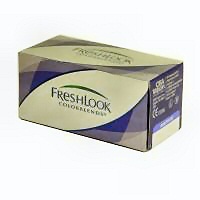 Freshlook ONE-DAY is the only daily disposable colored lens currently available on the market. They offer a great way to try colored contacts and cost just $14.95 for a box of 10 lenses. One slight drawback may be that they are only offered in either PLANO or minus prescriptions up to -6.00, so are only suitable for short-sighted patients or for 20:20 vision customers looking to change their eye color to make a fashion statement. NB: Always remember that even if you have perfect 20:20 vision, you MUST visit an optician to have your Freshlook color contacts FITTED first. Why? You may find that the wider than average diameter (14.5) of Freshlook contacts means that the standard 2 week disposable lenses will be too big for your eyes. You do still have the option, of course, of trying the One-Day Freshlook lenses, available in a diameter of 13.8, although you are more limited in terms of color options.